Your IJ30, IJ35, IJ40, IJ45 & IJ50 franking machine is capable of operating in various modes. 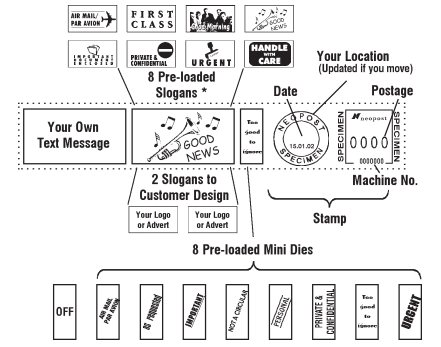 In Normal (Postage) mode, you can print postage, select a message from a number of pre-loaded or customised slogans (when ordered), in addition to a Slogan, you can compose and print your own Text Message, you can also select from a number of pre-loaded Mini Dies. It is also possible to Advance Date your mail by up to seven days. The IJ30, IJ35, IJ40, IJ45 & IJ50 franking machines offers a choice of up to 10 customised slogans. There are currently 8 pre-loaded slogans, as a factory setting, which are over writable. 1. Remove the ink cartridge by pressing ‘Menu’ then select ‘Cartridge’ then ‘Remove’. 5. If the problem persists try cleaning the brass print heads with a cloth, some warm soapy water and repeat the process above. From Ready Mode, press the “MODE” key, the MODE selection screen will be observed. Current Mode will be displayed. DATE ONLY: Prints the date instead of a franking mark. SLOGAN ONLY: Prints a slogan instead of a frank mark. SLOGAN & DATE: Prints a slogan and the date instead of a frank mark. TEXT ONLY: Prints your personalised text message instead of a frank mark. Using the arrow keys, or the appropriate number key, select required option from list, (e.g. DATE ONLY) press “OK” to confirm. Or to return to Ready Mode with mode setting unchanged, press “ESC”. Under normal operating conditions, your IJ30, IJ35, IJ40, IJ45 & IJ50 franking machine will produce excellent quality prints. However, if lines are missing from the stamp or the machine has remained unused for several days it will be necessary to clean the print-head or ink cartridge. 1. From Ready Mode, press the “MENU” key, the MAIN MENU screen will now be observed. 2. Using the arrow keys, or the appropriate number key,move the cursor to CARTRIDGE and press “OK” to confirm. The CARTRIDGE menu will now be observed. 3. Select the CLEAN option from the list and press “OK” to start the cleaning cycle. 4. On completion of the cleaning cycle the screen will revert to the CARTRIDGE menu. We advise that you now make a test print to ensure the cartridge is working. 1. Select the TEST PRINT option from the CARTRIDGE menu and press “OK” to confirm. 2. The prompt to produce a Test Print will now be displayed. To make a Test Print, insert a blank envelope or card and press the “START STOP” button. 3. Inspect the Test Print to ensure that all lines are clear and present. 4. To set the alignment, use the numerical keypad to enter the number that provides the straightest vertical line (for the example 5). Press “OK” to confirm, you will be returned to the CARTRIDGE menu screen. If any lines are missing, repeat the cleaning and test print process up to three times, if this process fails to restore print quality, fit a new ink cartridge. If the test print is satisfactory, press “ESC” twice to return to Ready Mode. 1. From Ready Mode, press the “MENU” key. Using the arrow keys, or the appropriate number key, move the cursor to CARTRIDGE and press “OK” to confirm. 2. Select the REMOVE option from the CARTRIDGE menu. 4. After a short time, the following screen will be observed: CARTRIDGE. INSERT CARTRIDGE & PRESS OK.
5. Open the machine top cover. 6. Press down & forward on the front edge of the ink cartridge. 7. Carefully withdraw the used Ink Cartridge and discard. 8. 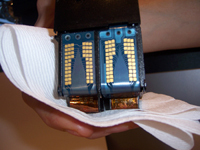 Remove the new ink cartridge from its packaging and carefully remove the tape seals. DO NOT touch or remove the copper strip on Ink Cartridges. 9. Place the new ink cartridge into its holder. Hold the Cartridge down with light pressure on the top and firmly push the Cartridge rearwards until it clicks into position. 10. Close the machine top cover and press “OK”. 11. After a short delay the prompt to make a Test Print will be observed. 12. Select the TEST PRINT option from the CARTRIDGE menu and press “OK” to confirm. 13. The prompt to produce a Test Print will now be displayed. To make a Test Print, insert a blank envelope or card and press the “START STOP” button. 14. Inspect the Test Print to ensure that all lines are clear and present. 15. To set the alignment, use the numerical keypad to enter the number that provides the straightest vertical line (for the example 5). Press “OK” to confirm, you will be returned to the CARTRIDGE menu screen. If any lines are missing, repeat the cleaning and test print process up to three times, if this process fails to restore print quality, fit a new ink cartridge. If the test print is satisfactory, press “ESC” twice to return to Ready Mode.